North Star is a Dealer and Authorized Repair facility for all SATLOC systems. The Satloc G4™ is the most complete and advanced aerial guidance system for aerial applicators. Satloc G4 is built with the top-of-the-line processing power of Intel® Dual-Core™ i7 processor and includes Windows® 7 64-bit operating system. The Satloc G4 features a 9-inch touchscreen capable of providing faster video graphics as well as the latest in touchscreen technology. Use multi-touch gestures such as pinch-to-zoom, rotate and press and drag to access information. Experience improved connection speeds for downloading job and shape files and prescription maps. The Satloc G4 features video capabilities including Skype™ and Ethernet connectivity for cell-based modems. Maps enhance flight navigation and confidence by allowing aerial applicators to view flight information such as spray, waypoints, and polygons on background maps. Stay connected with HQ™, a real-time web-based asset tracking tool that allows companies to track the position and position-related data of aircraft and other assets, such as spotter vehicles and loader trucks. The Satloc G4 system includes a 9-inch touch screen, CPU, A21™ antenna and external L7 lightbar. High Quality. Affordable. Compact. Rugged. The Satloc Bantam provides state-of-the-art GPS guidance for aerial applicators. Available with AirTrac™ guidance software, the Satloc Bantam allows you to fly and spray precise patterns using constant rate flow control, reducing fuel, flying time, and application costs. The Satloc Bantam lightbar guidance system features a real-time graphic moving map display that provides visual guidance, and shows key features such as swaths sprayed, field boundaries, skips and overlaps, mark points, waypoint and polygons. The AirTrac software allows you to track acreage sprayed, analyze log data, view range and bearing to remote points or fields, monitor application rates. The Satloc Bantam includes a 7" or 9" touch screen, CPU with 2 USB drives and 2 GB USB stick, A21 antenna and external lightbar. Other screen options are available. LiteStar III™ is the next generation entry-level guidance system for aerial applicators. The all-new L7 lightbar and intuitive controller will simplify and improve all types of spraying applications. Simply confirm pattern type and swath width at startup and go to work, or immediately recall the previous job after boot up and go right back to where you left off. The LiteStar III includes the L7 lightbar, LiteStar III controller, A21 antenna and associated cables. With the IntelliFlow™ control system on board, spray rates will be automatically controlled with an accurate constant flow or a variable rate based on prescription maps (PMAPs). The required flow rates can be pilot selected or PMAPs can be created by using MapStar® desktop software. 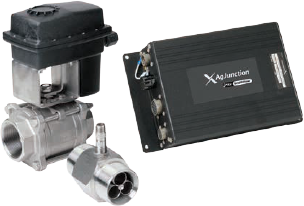 The system consists of a controller, valve with motor, and meter with magnetic sensor. Multiple sizes and configurations can be chosen for the valve and meter.